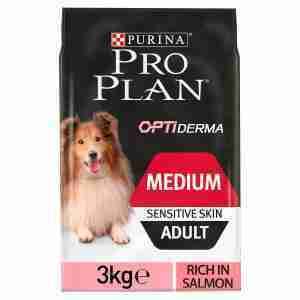 This Purina Pro Plan Dog Medium Adult for Sensitive Skin with Optiderma rich in Salmon dry food helps to keep your dog's coat glossy and their skin healthy. Lots of dogs suffer from sensitive skin, and it's easy to spot the tell-tale signs. If your pooch is scratching much more often, or licking a certain spot over and over, they might have sensitive skin problems. Sometimes diet can be the cause of this, as some foods irritate your pet's system and cause allergic reactions. Beef, wheat, and dairy are the most common causes, so choosing this Purina Pro Plan Dog Medium Adult for Sensitive Skin with Optiderma Rich in Salmon can help your best friend look and feel great while still getting all the goodness they need. If you do see any signs of sensitive skin, makes sure to speak to your vet as soon as possible. Sensitive skin can often be caused by diet, and proteins, which are found in meats like beef, as well as wheat and dairy, are the most likely to cause these problems. Skin irritation happens when your pet's body has trouble absorbing these proteins, and they treat it like an infection. This leads to inflamed and irritated skin. This food uses proteins that are much easier on your four-legged friend's tummy, and also has a special Optiderma formula to boost skin health. The food is also packed with additional nutrients to help keep their joints healthy. Ingredients: Salmon (14%), Rice (14%), Maize, Dehydrated salmon protein, Maize gluten meal, Maize grits, Soya meal, Animal fat, Digest, Dried beet pulp, Dried egg, Maize starch, Minerals, Fish oil, Dried chicory root, Soybean oil. Fantastic dog food, didn't realise how bad the ingredients were in the food I were giving my pooch we have permanently changed to this. My dog has recently tried this food and has easily moved across to it from her previous food. It seems to agree with her system and her sensitive skin. I was given a free sample of this dog food to try as my dog nibbles his legs constantly . I have to be honest and say that I wasn’t expecting to see much difference but he isn’t itching and nibbling half as much and slowing started to grow his hair back. He used to have itchy skin and bald patches but since eating this food, he is no longer itching and scratching all the time, which he must feel so much better for. My dog loves this product will definitely be buying Purina Proplan for my cavalier Ruby . She cannot wait for her breakfast now. Will be trying other flavours for a change. I was a bit sceptical about using this dog door as my girl is very fussy, however as soon as I opened the bag she was immediately interested. Within 5 minutes her bowl was empty she absolutely cant get enough of this food! She seemed to be scratching a lot before we tried this she now seems a lot more comfortable and a lot less scratching!